We are cooperated with Ecochem, a.s. who is a modern analytical laboratory offering a wide range of services in the field of chemical, radiochemical, biological, as well as physical measurements and analyses. Ecochem expertise covers environment and food, pharmaceutical and other industries. 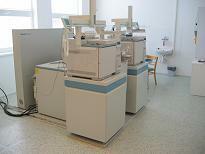 Ecochem laboratory network includes an accredited calibration laboratory. Ecochem provide sampling, statistical data processing, training and consulting support. Ecochem also produce and test certified reference materials. The combination of a highly qualified team of experts, state-of-the-art equipment and technical background enables us to provide effective solutions to large projects and at the same time meet the specific requirements of our clients. For more information about laboratory services please contact us.